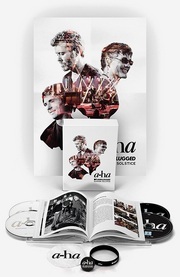 Norwegian musician and composer Lars Horntveth, known from the bands Jaga Jazzist and The National Bank, has recently been working on string arrangements for the new a-ha album Cast in Steel, it seems. 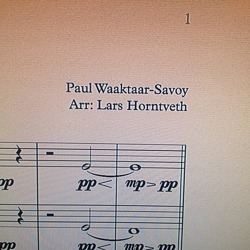 In addition, he posted a picture of sheet music for a new song written by Paul. Horntveth is also known for producing two of Susanne Sundfør’s critically acclaimed albums; The Brothel (2010) and The Silicone Veil (2012) – the latter of which included the lead single “White Foxes”. “I really loved Susanne Sundfør’s “White Foxes””, Paul said in an interview last year. Update: Per Lindvall and Peter Kvint are also busy working on the new a-ha album. On April 29th they did a recording session at the Atlantis Studio in Stockholm. Per Lindvall posted some info about the session on Facebook here, and Peter Kvint also posted some info here. “My philosophy is to surround myself with truly talented people who make my work sound better than it actually is. Today with rhythm maestro Per Lindvall and sound guru Simon Nordberg. We recorded drums for a couple of new A-ha songs at Atlantis”, Kvint wrote. This will be the 12th a-ha concert in Paris since 1986, and the 5th a-ha concert in Amsterdam since 1993. 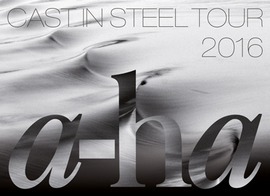 The total number of concerts on next year’s Cast In Steel Tour is now 17, with many additional dates expected to be added. Tickets for Paris and Amsterdam are available now from gdp.fr and ticketmaster.nl.